Another little newcome in our family, and since the choice was for a solar system by the happy parents, I tried to come up with a girly spacequilt. It was several round of redesign of the color palette in my head. 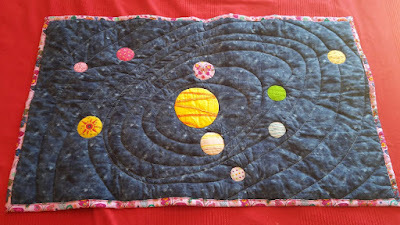 For quilting I used perle cotton, with long stitches and I really like the final result. That reasoning is perfect 😀 love the idea.